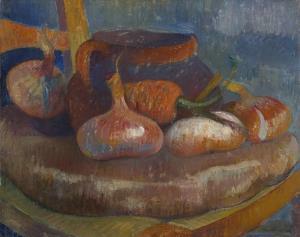 Find artworks, auction results, sale prices and pictures of Jacob Isaac Meyer De Haan at auctions worldwide. Description: DE HAAN, Jacob Meyer (Meijer), (Dutch, 1852-1895): Scene Depicts Distraught Seated Older Gentleman Wearing a Hat in an Interior, Oil/Canvas, 28" x 21.50", signed verso with early label affixed to the canvas, framed 35" x 28.50". Hand written paper affixed claiming this picture was from the home of C.W. Braat-Heibroek. Old Frederik Muller and CO auction label affixed to canvas verso. Estate item - must be sold. 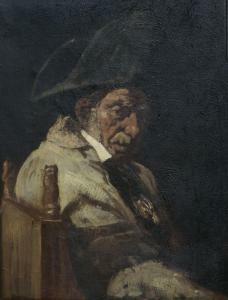 Description: DE HAAN, Jacob Meyer (Meijer), (Dutch, 1852-1895): Scene Depicts Distraught Seated Older Gentleman Wearing a Hat in an Interior, Oil/Canvas, 28" x 21.50", signed verso with early label affixed to the canvas, framed 35" x 28.50". Hand written paper affixed claiming this picture was from the home of C.W. Braat-Heibroek. , Amsterdam, Paris, and Quimper, 2009, p. 152.
at the Jewish Historical Museum of Amsterdam, the Musée d'Orsay, Paris, and the Musée des Beaux Arts, Quimper. Marie-Jeanne Henry was innkeeper of the auberge known as La Buvette de la Plage at Le Pouldu in Brittany, where Meijer de Haan lodged from October 1889 to October 1890. De Haan had arrived in the isolated Breton coastal village to take painting lessons from Paul Gauguin, in exchange for acting as his secretary and general factotum, while he came into his own as a painter and developed his personal style. In the course of the year the pair decorated the dining room of the auberge, eventually covering the walls with their paintings. 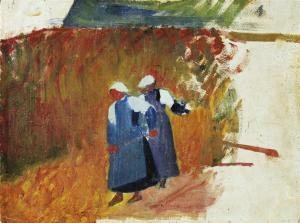 The auberge was also a popular haunt of artists such as Maxime Maufra and Paul Sérusier, who came to visit their fellow painters in Brittany. Meijer de Haan and Marie Henry became lovers (some sources suggest that the married Gauguin also pursued 'Marie la Bretonne', also known as 'Marie la Poupée' for her doll-like beauty, but in vain) and she became pregnant around the time that de Haan left Le Pouldu in 1890. He left most of his belongings at the auberge, including many paintings, implying that he perhaps intended only a temporary absence. It is not known whether he knew that Marie was pregnant. De Haan never returned to Le Pouldu, and never acknowledged their daughter, Ida. He died of tuberculosis at Hattem, in the Netherlands, in 1895, at the age of forty-three. 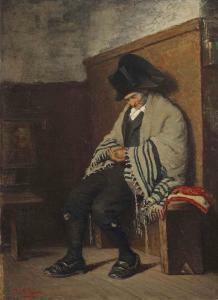 Meijer de Haan (Amsterdam 1852-1895) Asleep in the synagogue, Amsterdam signed 'MJ de Haan' (lower left) oil on panel 53 x 38.5 cm. Painted circa 1879-83. In possession of the family of the present owner since circa 1907. (Probably) Jelka Kröger, Meijer de Haan: A master revealed, Amsterdam, 2009, p. 152, as: Ingesluimerd (Asleep), circa 1879, further details unknown. (Probably) Amsterdam, Maatschappij Arti et Amicitae, Tentoonstelling van kunstwerken van Levende Meesters, 1879-80, no. 94, as: Ingesluimerd. Marie Ida Cochennec, Rosporden (Marie Henry's seconddaughter). H. Duteil, Moëlen sûr Mer et Veronique Cochennec, Maison-Alfort(Marie Ida Cochennec's daughter). Purchased from the above by the family of the present owner onOctober 28, 1978.